This app brings the world of work into the classroom, with a geometric calculator that can be used to calculate sides, angles, area and perimeters of many common shapes. A great assistant for geometry lessons, allowing children to either check their answers automatically or to be used as a reference tool to lookup the required formula where needed. Ideal for the workplace, but needs some tweaking to make it child friendly. 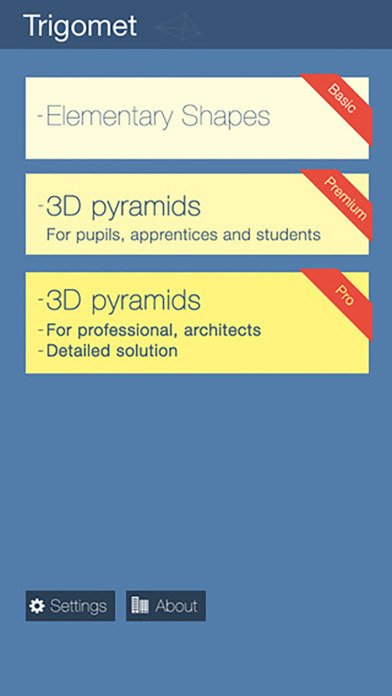 With basic geometric concepts introduced at KS2 that continue to be extended through KS3, GCSE and beyond, this app brings the world of work into the classroom, with a geometric calculator that can be used to calculate sides, angles, area and perimeters of many common shapes. Upon opening the app, users are presented with three different levels of formula: basic elementary shapes; 3D shapes for students and 3D shapes for business professionals. The first section, elementary shapes, is subdivided into triangles, quadrilaterals and circles, and when a specific shape is clicked, users are taken to a page with an enlarged version of the shape along with a series of letters representing lengths or angles. The user is required to enter some basic information about the shape and the app performs a variety of calculations returning key information about the shape and its properties. Generally, this includes: area; perimeter; size of angles and length of sides including the hypotenuse. A slight annoyance here, is when clicking between pages, the device often rotates unnecessarily. After entering the information and clicking calculate, users are presented with most measurements needed in regard to the shape. Listed as a series of letters and numbers, it can seem overwhelming and confusing for some, but with some instruction and a little practice, users should be more comfortable with the terms used. Younger children (KS2/3), will need guiding through the meanings of these letters - perhaps a printout would be helpful. In order to match the app more to the curriculum, the developers might consider using more child friendly, simpler terms where letters are matched to the concepts introduced, for example, “A” for area, “P” for perimeter and “H” for hypotenuse, instead of the “S”, “U” and “E” used at present. As well as “results” users can also view the “formulas” page, which explains how each measurement is calculated. These two core pages, “results” and “formulas”, are both extremely useful and could easily be incorporated into lessons, either as a means of checking answers to questions or alternatively used as a reference tool for looking up formulas. The second section is set out in a similar manner but encompasses concepts around 3D shapes. Such ideas are usually introduced at KS3 and extended into GCSE, so the language used is more appropriate, however, the pictorial representations of the shapes are extremely confusing as they are shown in 2D with letters scattered throughout the shape. It would be much more appropriate to represent these diagrams in 3D and perhaps allow the users to engage and explore shapes by having the ability to rotate them. Returning to the homepage, the “About” section provides a nice introduction to how the app came about through real life applications. It’s nice to see a developer taking real world applications for mathematics and bringing them back into the classroom for children to use and experience. 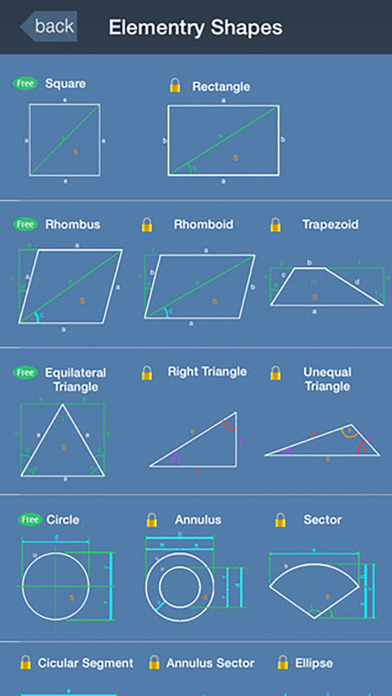 In terms of in app purchases, the first section allows users to view basic shapes (square, rhombus, equilateral triangle and circle) for free, however, the remainder of shapes must be purchased (rectangle, trapezoid, right triangle, unequal triangle, annulus, sector, segments and ellipse). Similarly, the second section offers a triangular pyramid for free, but all other pyramids must be purchased (square, hexagonal, octagonal and dodecagonal pyramid). Overall, this app is worth of a 4-star rating. A great tool which could be used either to check answers or as a mathematical reference tool. It has a lot of potential in the classroom, but could do with aligning the language and concepts more closely to the curriculum. Trigomet allows complicated calculations in different segments and presents them in a clear and simple way. 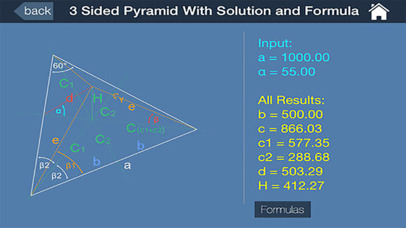 Trigomet allows for a technical and process-oriented solution of complex calculations that involve geometric figures. "Simple shapes for students "
Students can solve their tasks according to the principle "Enter data - obtain results and solutions" very easily and quickly. The structure of the formulas follows a comprehensible structure. 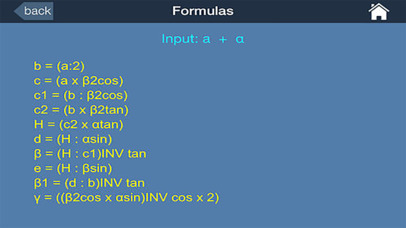 With every geometry calculator (sine, cosine and tangent)), students can type all formulas, according to the given guidelines, in the calculator. This helps prevent confusion and miscalculations.
" 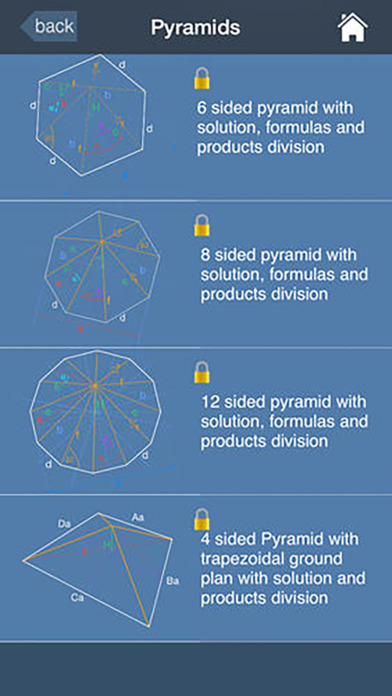 3D pyramids for learners and students"
results and angles for their exam work. "3D pyramids with features for professional users and architects"
For architects, the calculations contain an additional "feature" to allow for calculation of divisions for patterns of all materials directly with the app. This allows very fast quotations and target cost estimates for customers, without loss of some precious time with the CAD. and corners, surfaces and edges.